As women approach middle-age, they often find they gain weight, sometimes even if their lifestyle has not changed. There are a number of reasons for this trend, and it is by no means uncommon. However, it is still worth getting help and advice to avoid or reduce weight gain, as it can pose some serious risks to health. With a few simple lifestyle changes, many women find that the weight gain can be safely and sustainably reversed. 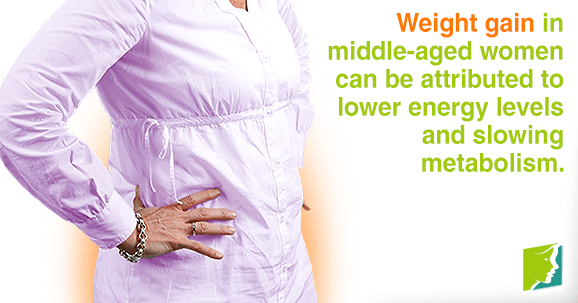 Keep reading to find out more about weight gain in middle-aged women. As women approach middle-age, most are no longer as energetic as in their younger days, and this can have an impact on levels of physical activity. The logic here is pretty self-explanatory; the less exercise a woman does, the more weight she will gain. As a result, this aspect is relatively easy to deal with - increase physical activity and decrease weight. Hormonal imbalances also play a role in weight gain. As many middle-aged women are going through menopause, this time of life can be beset by estrogen imbalances, which causes a shift of fat deposits from the hips to the waist. This can result in menopausal weight gain. With age comes a natural decrease in muscle mass and metabolism. Unfortunately, this means that weight gain can occur, even if dietary and lifestyle habits have remained the same. In short, a woman now needs fewer calories to maintain the same weight, which might take some getting used to. In addition, losing muscle mass can also contribute to weight gain, as the muscle turns to fat. Many middle-aged women who gain weight subsequently suffer from low self-esteem and embarrassment, and often say they feel judged by society. This can lead to feelings of anxiety or depression, which can spill over into other areas of life and even sometimes turn into clinical disorders. These feelings will usually be exacerbated if a woman is also going through menopause and is experiencing hormonal fluctuations. If the body is carrying too much weight, the heart has to work harder to pump oxygen to all the cells, and this results in increased blood pressure. This can lead to a variety of health problems, some long term or even life-threatening. In addition, the extra stress that the heart is under increases the chances of heart disease. Weight gain in middle-aged women is common but should not be ignored. In order to avoid the health problems that can accompany too much weight gain, healthy lifestyle choices should be implemented. It might help to see a doctor and ask for ways to lose weight safely and get advice on local services. Read more about approaches for treating weight gain.